If you want to operate your televisions, DVD players, VCR, and stereos by using a Hitachi TV remote then you need some Hitachi tv remote codes for programming your Hitachi TV universal remote control. We take a simple guide on how to program a Hitachi TV Remote and which Hitachi tv codes use for the universal remote. You can follow this article for programming your Hitachi TV Remote as a universal remote. Turn on the power of your television, stereo or DVD player. Verify your selected component is ON state. Take your Hitachi Remote, press on the Code Set Button. 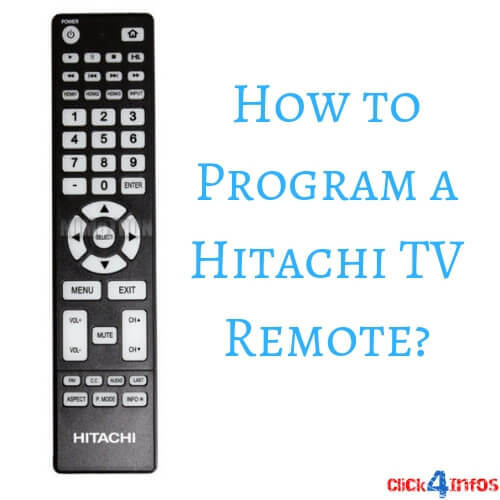 Select your component such as TV, DVD and other which you want to program with the Hitachi Universal Remote. Enter your Hitachi remote control code for your selected component. You can find out your remote code in below list. After that, press on the enter button for programming your Hitachi TV remote as a universal remote. You can use the below remote codes for programming the All Hitachi items such as TV, DVD players, Seteros and many more. You can use the 4 digit universal remote control codes for Hitachi TV and other components. Please verify your Hitachi remote code before to use. Previous articleHow To Program Dish Remote To Vizio TV?